Blood pressure management is an essential factor in healthcare. 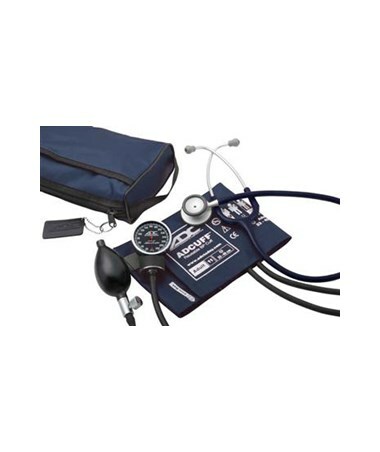 Busy clinicians and emergency professionals frequently use blood pressure devices in life-and-death situations, but are often hindered by bulky, heavy, impractical equipment. 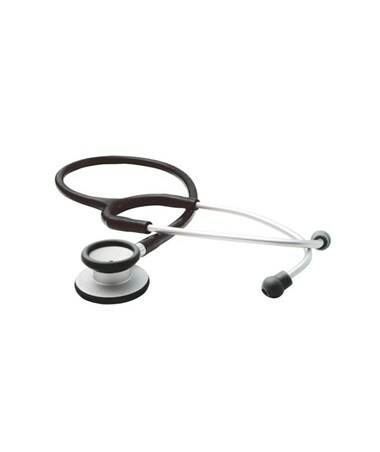 ADC provides the solution to this vexing problem with the Pro’s Combo V Pocket Aneroid Kit, a full-featured yet lightweight aneroid and stethoscope combination. 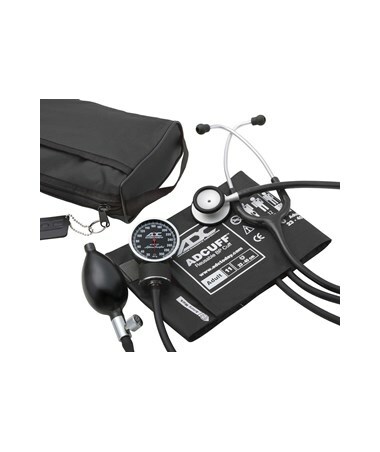 This kit offers all of the gear that nurses, EMTs, PAs, and other medical professionals need for blood pressure management on a regular basis. The Pro’s Combo V Pocket Aneroid Kit features one of ADC’s finest pocket aneroid, the Diagnostix™ 720. Its Japanese-engineered manometer exceeds industry performance standards with its classic black baked enamel finish and extended scaleplate graduation marks to reduce parallax for easier viewing from virtually any angle. 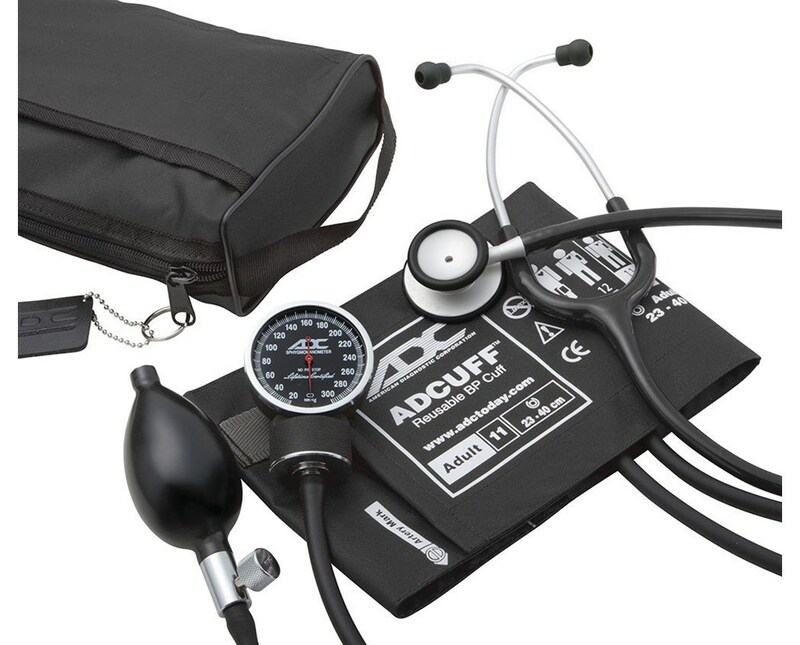 A color-coordinated professional Adscope™-Lite 609 acoustic stethoscope makes this kit an all-inclusive equipment bag, conveniently packaged in a matching oversized two-pocket carrying case. The Adscope™-Lite is an innovative instrument that combines superior acoustic response with an ultra-lightweight design for an ultimately portable and high-quality tool. Its Adsoft™ PVC eartips and non-chill bell and diaphragm retaining rim ensure the comfort of both the user and the patient. The included adult-sized AdCuff™ latex-free nylon cuff boasts the innovative Size Guide™ marking system to prevent mis-cuffing. The kit is available in black, burgundy, dark green, gray, navy, orange, red, royal blue, teal, and violet to suit every user’s tastes and needs. View color choices by clicking on any thumbnail image to enlarge. Select a kit color from the drop-down menu in the upper right corner of this page.